Instinctive and innovative, architect John Lautner designed a portfolio of celebrated California homes, many of which became stars of the silver screen. 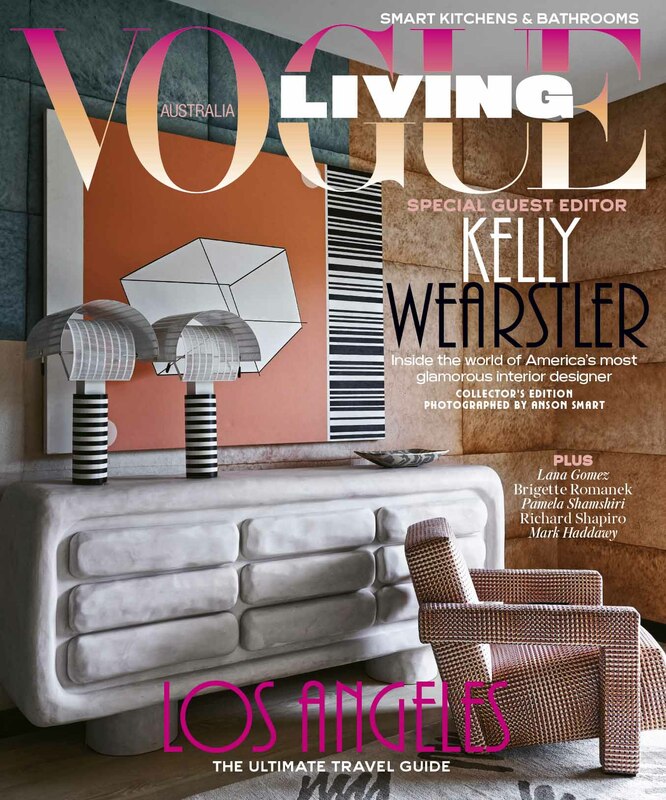 For those who worship at the altar of 20th-century architecture, the Los Angeles house is particularly revered. The low-slung city’s range of residential designs is astounding: Charles and Henry Greene’s Craftsman bungalows, Irving Gill’s concrete cubes, Rudolph Schindler’s groundbreaking Kings Road House (1922) and the textile block homes of Frank Lloyd Wright. Richard Neutra designed multiple, light- lled pavilions in the International Style, leading to the era-de ning Case Study Houses of the postwar period, and even Brazilian architect Oscar Niemeyer left his indelible mark in Santa Monica with Strick House (1963). 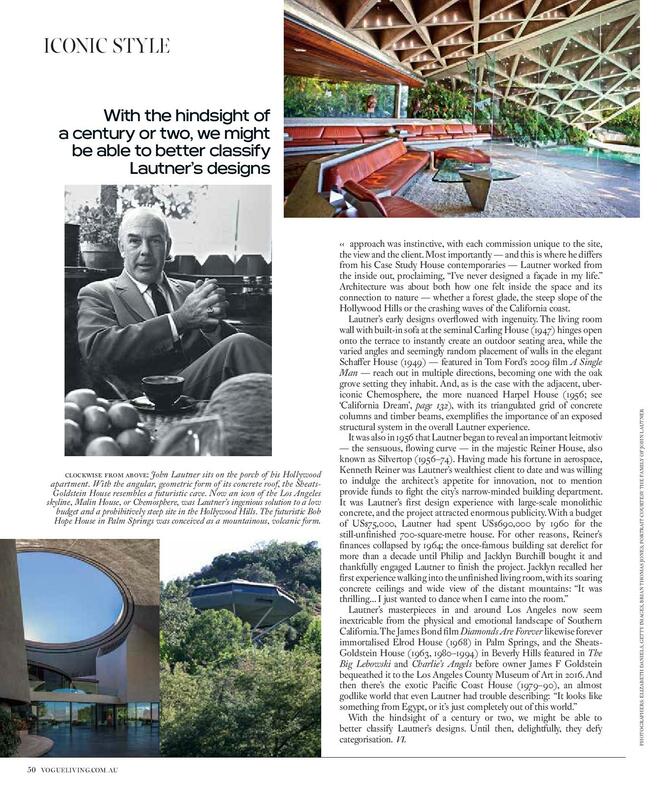 However, of all the architect gods who carved out this dazzling constellation of modernist homes, if one is to be singled out, it must be John Lautner, who took his craft to a new, almost ethereal level. Lautner’s style is perhaps best surmised by the current owner of Segel House (1979), a Los Angeles businesswoman who purchased the Malibu property from Courteney Cox and David Arquette in 2006. She describes it as a “living organism” that breathes with her — one of her “closest friends”. In more concrete terms, Lautner’s aesthetic sat somewhere between the primitive, with cavelike rooms and roof lines resembling man kind’s earliest dwellings, and the futuristic.Chemosphere (1961) and Garcia House (1962), for example, look like spaceships about to take ight. Much of this, however, was unintentional; his approach was instinctive, with each commission unique to the site, the view and the client. Most importantly — and this is where he di ers from his Case Study House contemporaries — Lautner worked from the inside out, proclaiming, “I’ve never designed a faÇade in my life.” Architecture was about both how one felt inside the space and its connection to nature — whether a forest glade, the steep slope of the Hollywood Hills or the crashing waves of the California coast. Lautner’s early designs over owed with ingenuity. The living room wall with built-in sofa at the seminal Carling House (1947) hinges open onto the terrace to instantly create an outdoor seating area, while the varied angles and seemingly random placement of walls in the elegant Scha er House (1949) — featured in Tom Ford’s 2009 lm A Single Man — reach out in multiple directions, becoming one with the oak grove setting they inhabit. And, as is the case with the adjacent, uber- iconic Chemosphere, the more nuanced Harpel House (1956; see ‘California Dream’, page 132), with its triangulated grid of concrete columns and timber beams, exempli es the importance of an exposed structural system in the overall Lautner experience. Lautner’s masterpieces in and around Los Angeles now seem inextricable from the physical and emotional landscape of Southern California. 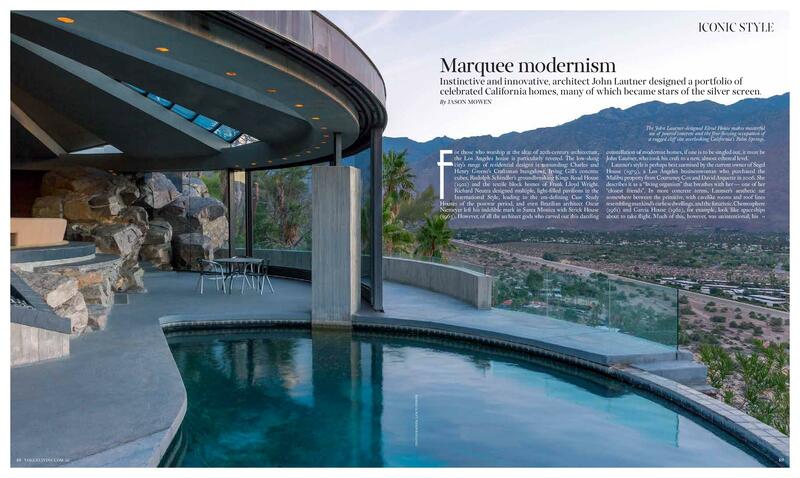 The James Bond lm Diamonds Are Forever likewise forever immortalised Elrod House (1968) in Palm Springs, and the Sheats- Goldstein House (1963, 1980–1994) in Beverly Hills featured in The Big Lebowski and Charlie’s Angels before owner James F Goldstein bequeathed it to the Los Angeles County Museum of Art in 2016. And then there’s the exotic Paci c Coast House (1979–90), an almost godlike world that even Lautner had trouble describing: “It looks like something from Egypt, or it’s just completely out of this world.” With the hindsight of a century or two, we might be able to better classify Lautner’s designs. Until then, delightfully, they defy categorisation.